This review is brought to you by our sponsor Angolz.com where I get all of my Saint Cloth Myth. If you have read my previous reviews of these Saint Cloth Myth figures you may have figured out that there is a lot of drama around certain Cloth's in the series. To be honest the whole series is really about the drama of the Cloth's. We are introduced to this Japanese take on Roman/Greek Mythology thru the eyes of Seiya as a young man, as he grows in age and skill so does his (and our) understanding of the bigger story and just how far back the story goes and how truly epic the saga becomes. 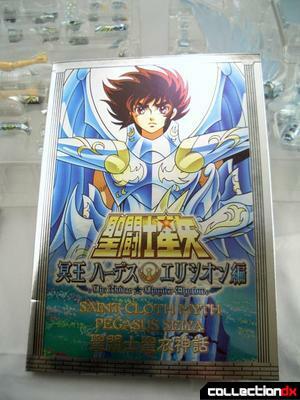 Our hero Seiya gets his Pegasus Cloth destroyed in his battle with the Thanatos. Only to have the Sagittarius Cloth come to his aid. 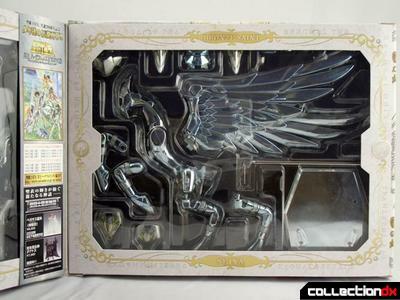 The Gold Sagittarius Cloth however is not strong enough to defend against the God of Death's attacks and shares the same fate as the Pegasus Cloth, shattered into a million pieces. Angolz was nice enough to send me the metal plate for this release. Metal Plates are popular with collectors. These plates are used to decorate the after market stands for the characters. Often figures will come with new "clips" to attach the figure in unusual poses or accessories. The inside of the package is also like previous Saint Cloth Myth releases, all the parts and pieces packed neatly in vacuum formed trays. Included with the instructions where also a sticker for your Saint Cloth Myth stand and the mail in form and information on the Saori Kaido release. No surprises here. It's your standard 3rd generation body type with over 40 points of articulation and standing about 7 inches tall. 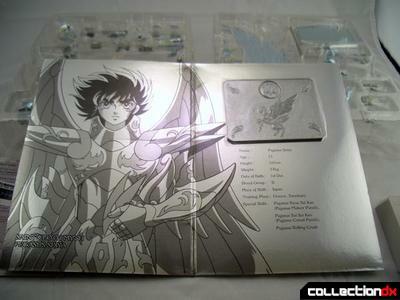 Seiya's “clothes” are molded in white instead of the usual red he appeared in throughout the rest of the series. With the armor on, this is one beautiful figure. It shines and glistens under the light. What didn't show in the press photos is the armor actually has the faintest blue ting to it. The armor is so shiny in fact if you look carefully you can actually see me and the camera in the reflections on the armor. 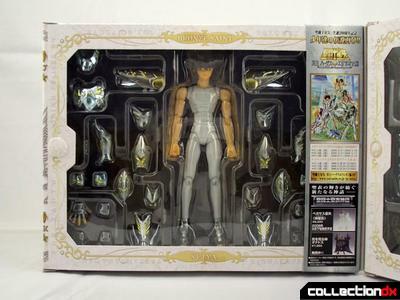 This one doesn't have as much die cast metal as previous Seiya releases, a little disappointing but not a huge deal. Diecast parts include the arms, upper legs, knees, part of the chest, outer waist and shoulder pieces. All the rest is plastic. Wow, it's pretty. Even though it doesn't have as much die cast as previous releases I really like it. If your a fan of the series you should already own this, if you don't you should. Non fans and toy collectors in general should give this one a try. 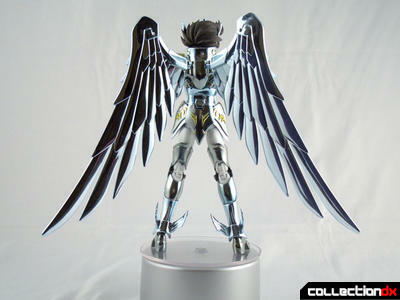 The large wingspan, silver/blue armor and the design just look great on the shelf. The Saint Cloth Myth line is always top notch and God Cloth Seiya here doesn't disappoint. You can get yours at Angolz.com where I get all of my saint Cloth Myth figures. Excellent review. Really liked the video. I agree that the figure needs more diecast, but the figure looks awesome nonetheless. Awesome review and amazing myth cloth. Now that i've seen the review and I am tempted to get this before I get the Poseidon ROE Myth Cloth. Great job. I am becoming more and more tempted to buy at least one of these figures, even though I don't know incredibly much about the series (I'll be honest, I'm an ungrateful fool and don't always read ALL of the background info you pack into your Cloth reviews...please forgive me!). As awesome as this one looks, if I were only to buy one, it most likely wouldn't be this one because the lower die-cast content kind of turns me off. Great review, I'm not a seiya fan , but Phoenix and Dragon Kamui are a must, those are fantastic. Just a little comment on how the cloth comes to life. 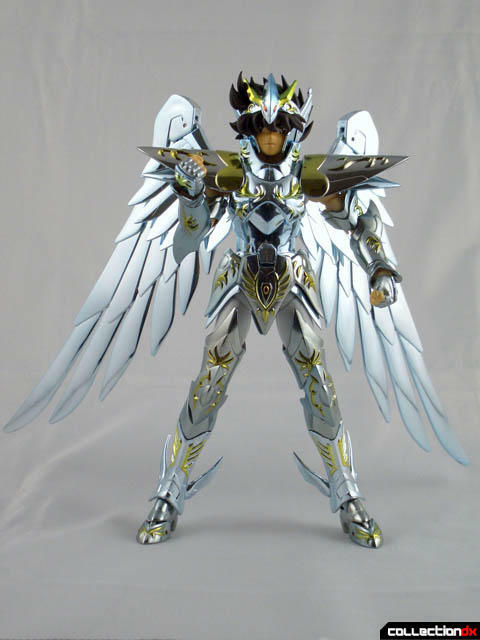 Pegasus Kamui is born from the combination of the bronce cloth, athena's blood and the cosmo to create miracles. the Gold Cloth has nothing to do with it. remember that ikki could only get his divine cloth after he touched athena's blood on the floor next to the vessel were she was in hades temple. And about the style, I always saw them more like inspired by athena's cloth that the gold ones. Did you see the last episodes of elliseum , they were released last week. Either way, most of the divine cloth origin is speculation. Some people say tha they can only be used on elliseum or divine places since the bronze saints don't wear them in tenkai overture and pegasus cloth evolves againg but into something different. I am thinking of buying this from angolz.com but i am wondering if customs will charge me an arm and a leg for importing this or if i will be charged anything at all. What is your experience with this Atom? I am beyond perplexed with this. A lot of it depends on where it is being shipped to. UK buyers most often get hit with customs if not marked as gift. I was wondering if all the metal plates can be used for the stands because angolz says some cant so I dont know which will fit on my figures base. Atom, what are you reviewing next? when can we expect it? You're reviews are as addicting as peanut butter and crack sandwiches. I've been reading all your reviews on the SCM line ever since I stumbled on this one and have been checking back quite often anticipating new ones. Thank you for all the great reviews (and you have them on videos too!) we appreciate the effort you are putting into these works. And for such a great review I was prompted to get this figure along with the metal plate. But then, I was wondering how you manage to remove the metal plates from the board as it seems to be attached quite tightly and hard to remove without damaging the cardboard...? Is there a proper way of removing this without compromising the container as it also looks quite nice. I have found one way to remove the plates without making a lot of damage to the cardboard. All you have to do is to use a hair blower on the back side of the cardboard. The warm air will make the double sided tape weak enough to remove the plate without damaging the package (it requieres a bit of patience though).